Lately, Facebook Inc. (NASDAQ:FB) users are indignant after the company’s insensitive take on the Cambridge Analytica files. People sprang up on Twitter and littered it with tweets of deleting their Facebook accounts with a hashtag #DeleteFacebook. The hashtag #DeleteFacebook is trending since the news broke out that data of 50 million users were harvested by the data analytics firm Cambridge Analytica during 2016 US presidential elections in a bid to manipulate votes. 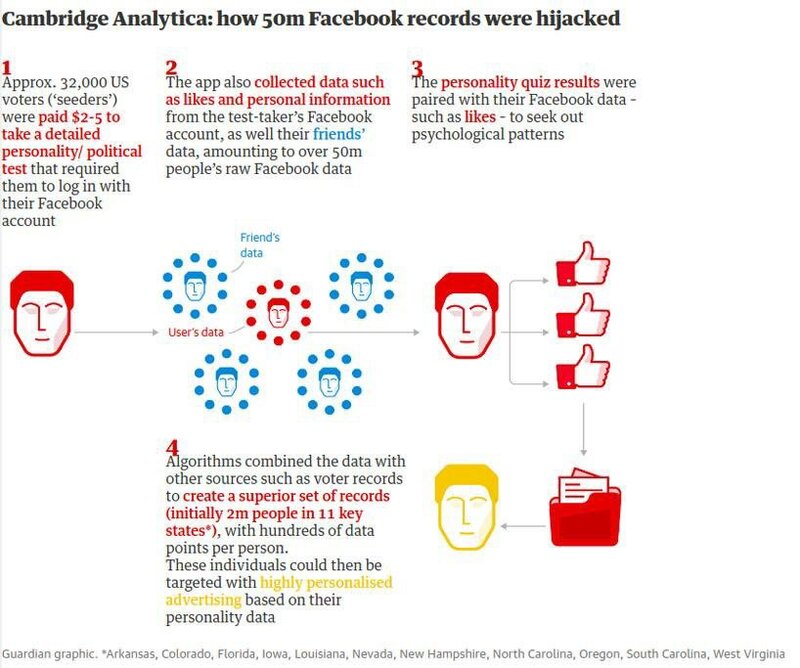 Christopher Wylie, the protagonist and whistleblower, revealed to the Observer that how Cambridge Analytica, with the help of a personality-testing app, hijacked records of 50 million Facebook users. This was allegedly done to specifically target and influence the voters in the electorate during Donald Trump’s presidential campaign in 2016. Facebook privately knew all this since 2 years. The app “thisisyourdigitallife” was created by Cambridge professor Aleksandr Kogan. It allowed him to extract information on different personality traits of the users and their “friends”. Though the users were assured that this information was gathered for academic research, but the data was leveraged by Cambridge Analytica to target and influence voters with specific personality types. Your profiles can be ‘harvested’ without your knowledge. The data accessed by the apps include things we have ‘liked’ on the site, page visits, permissions we give to access our public and personal information. If you come to think of it, all of this has made a personal life of the users so much vulnerable. The recent uproar has resulted in #DeleteFacebook movement gain a lot of momentum. The revelations made by Wylie have highlighted the danger of Facebook housing personal information of millions of users. Facebook has said that there was no data breach in their system. It suspended Cambridge Analytica and Strategic Communications Laboratories (SCL) on Friday. A couple of days later, it suspended Wylie’s Facebook and Instagram accounts. Facebook has also said that Kogan accessed the information in a legitimate way but he failed to abide by the rules of the company when he shared the information with third parties. Facebook had asked Cambridge Analytica to destroy the information on its users in 2016 but failed to follow up on the matter. Moreover, the company has denied that it used any user information from Facebook during 2016 presidential elections. Amid to the heated speculations, Facebook’s stock has plunged nearly 8% by the time market closed on Monday. Should You Consider Deleting Your Account? Evidently, people were not supportive of the incumbent behaviour of Facebook. This reported incident of the data breach is arguably the biggest scandal in the company’s 14-year history. Also, it has come out to be too overwhelming for its users as a result of which #DeleteFacebook movement has gained a lot of steam. On users part, to avoid such kind of data breach being used to target you, you need to be a little more careful about the data permissions you give to your connected apps. Even your friends can offer your information unknowingly to third-party apps during certain permissions. Probably your feeds already have ‘highly personalized ads‘. We won’t tell you what to do, but if you are thinking of deleting your Facebook account, there is something you should consider beforehand. First things first, there is a difference between deactivating and deleting your account. Deactivating will only put you off the map, but once you come back and login to account your profile will be up and running. Deleting your account will remove your every essence from Facebook – but there is a catch. The deletion request can take up to 90 days from the start of the process to remove each and everything related to your account. But deleting and walking away isn’t as simple as it sounds. People are in dilemma as to how to recreate those memories collected in their profiles, how to keep in touch with their loved ones. If we consider the alternatives of Facebook and its Messenger app, are they secure enough. What if Instagram or WhatsApp is tracking us too? Maybe in the backdrop, Facebook is a data collection service for those who want to sell your products. Is Facebook compromising the real reason we started using social media in the first place – human connection?